One of the photographs from the CGS 110th anniversary bookmark, was this one taken on the wedding day of Clare and Alta McAllister THOMSON, parents of Thomas Thomson, who is the husband of Shirley Pugh Thomson, CGS board member and recording secretary. The young bride and groom (she only 18, he age 19) were photographed 4 June 1916, in Sullivan County, Indiana. In the back seat are their best friends and witnesses, Paul and Lena Sharpe. The Buick was owned by the groom’s father, as was the camera, and it was dad who took the picture. The blog description prompted this response from CGS News Editor, Jane Hufft: "The copy you have with the photographs is so informative and interesting. 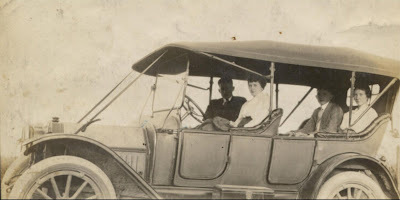 The picture sparked a connection for me: I have a photo of my grandparents c. 1916 that could be a twin to Shirley's; everyone is dressed up, looking out of an open car, event unknown, and it NEVER occurred to me that it possibly is a wedding photo -- and we don't have any others for them. Perhaps that was a photographic style then. Thank you so much for the clue." I checked with Maureen A. Taylor, the Photo Detective, who has written about old automotive photographs, most recently in an article entitled "Motor Trends" in the July 2007 issue of Family Tree Magazine. She agrees that there may be other photographs that appear at first glance to be just folks in old cars, but which in fact are chronicling weddings or other significant events. Maureen notes: "You see a lot more people in front of cars once they are more enclosed. Men drove, women generally didn't. How interesting that the woman is behind the wheel!" 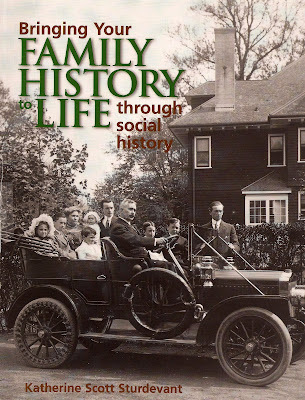 The cover of Katherine Scott Sturdevant's book, Bringing Your Family History to Life Through Social History, depicts a family dressed in their Sunday best in a circa 1910 automobile. The photograph, identified as "William H. McKernan, Brooklyn" was supplied to the publisher as a research experiment. Ms. Sturdevant analyzes the photograph on page 89 and presents a case study which includes dating the vehicle and city directory and census research on the family. She makes a strong case that it is the family of William H. McKiernan and notes that the children in the photograph match the "genders and ages of the census children... if the oldest child, Mary, was elsewhere when the photograph was taken. She would have been about twenty." Knowing what we know now from Shirley's and Jane's photographs, I wonder if the family was off to attend Mary's wedding? 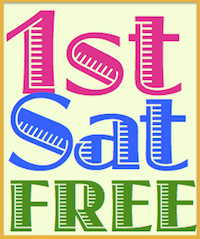 Written for the 45th Carnival of Genealogy, Cars as stars! What they said - delightful and delicious! Great post. Cars and houses. Two things people love to pose in front of in photographs! The great thing about photos with (historical) cars of course is that they immediately fix the subjects in an era, and evoke that era.